I have been on the lookout for a cute, flowing black polka dotted blouse ever since I pinned these to my what to wear board on pinterest. Working on a limited budget and having little success I was to the point of buying the fabric to make one. Then I discovered this black and white printed blouse in my closet with the tag still on. I have no idea when I bought it (probably while I was still a working girl) but I thought it made a pretty good substitution and I couldn't beat the price. Having just found these cute yellow sandals on clearance for $5.95 at Target, (thanks for the tip Elaine) I decided to go with the black and yellow inspiration photo. 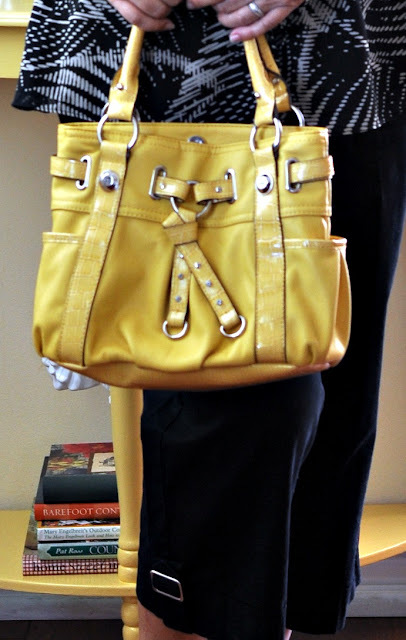 The yellow bag was already in my purse collection and I love the pop of bold color it added to the outfit. Do people still say outfit or is there a more hip word now? Do people still say hip? Since I was wearing this to church, I opted for black capris pants but think it could easily be switched to jeans for a more casual look. So there you have it. 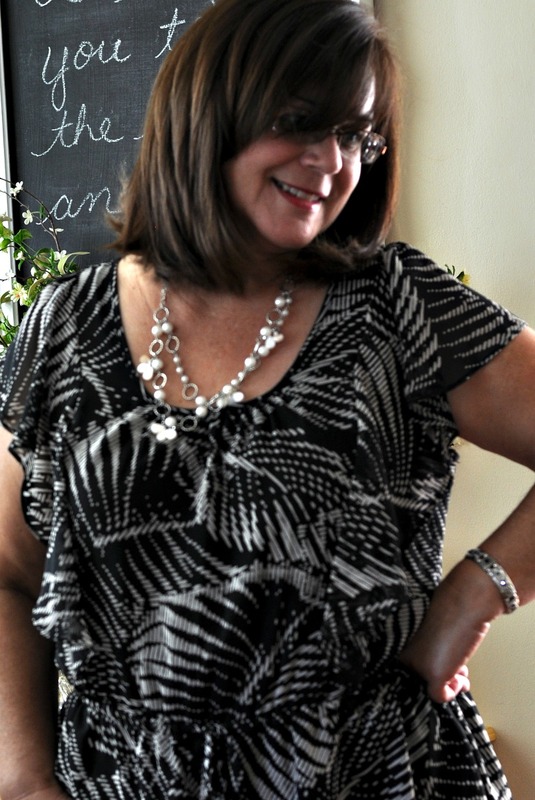 My first 50+ fashion Monday post. A few things I learned for next time...make sure your floor is well swept before shooting. Get a pedicure if your going to wear sandals. I have my moms hands, I hope they show as much love with their age as hers do. Have a wonderful week and remember you are worth the effort it takes to look nice no matter what your age. You look lovely, Patty. I like the outfit (I've heard some say "the look") and the touches of yellow. I need to step up my game. It's been t-shirts and capris for the summer. One more thing,you have such pretty hair. It looks so nice and thick, lucky girl! So cute and fun! Love the black and yellow combo! YOU, dear friend, look A M A Z I N G!!! I adore your black, white and yellow outfit!!! YOU should have many, many more photos of you in the future!!! and added my Autumnal Wardrobe. Y I K E S!!! School Personnel and Medical Assistant attire!!! I've been retired over a year now. . .
so off for a bit of fashion updating on Thursday!!! Ah~h~h. . .so much better and in keeping with my current clothing needs!!! However, I may need to do a bit more shopping. . .
so keep those inspirational photos coming!!! Great job on your fashion post, Patty. I think fashion after 50 is a challenging thing. I really like this outfit (I still say it, but then I'm over 50 :) you put together. You look very stylish. I also got a great idea here today. I have had a yellow purse for a few years and had never thought to put it with black and white. I am the same way about photos of myself - but you look gorgeous! Yellow and black is a great combination, and I see you are also a Kohls fan like me. I loved your fashion post and I hope you do more! Patty, thanks for braving the camera(you are beautiful, BTW) and sharing your cute outfit! Love the yellow with the black and white. My sister and I have been saying for years the designers are missing out on not making clothes for women in their 40's and 50's. You pulled this look together perfectly! Keep them coming, please! You look lovely and I myself would be more than thrilled to wear that at 37! Nice job--you look great! I was reading an article on a blog the other day and the author was talking about her rule for finding outfits to copy on Pinterest...she only pins outfits that she already has one of the pieces for, so she's using what she already has and is not starting totally from scratch. You did this! Hope you'll post more outfits for those of us in the Fab 50 club! You look darling in that outfit. I love yellow and black together. Great job!! You look fabulous! I love the outfit. Looks great, and actually something I would wear (I tend a little toward conservative, but still don't want to dress like an "old lady" as my grandies call me sometimes). Patty, you are a beautiful woman, inside and out!! You look so cute. It is hard to take your own pictures for sure. Then when someone else does we are always so critical. But you look good, girlfriend. You look adorable! Why are we so hard on ourselves? (Myself included) Looking at our family photos when the girls were little you would have thought they were poor motherless little kids. I was behind the camera as much as possible. I really am enjoying this series you are doing. I've never been much of a snazzy dresser to be honest, jeans and a tee and not much thought given to those! I am accessories challenged to say the least. But as I have gotten older I find I really want to look my best. After all those years of "easy dressing" I feel pretty clueless. I love your style and pinning some of these on pinterest really helps me see how to accessorize and that there are other colors than black and tan. lol. Thanks for making fashion fun. Great post and photos Patty. You look great! I look forward to your fashion updates. You are too cute Patty! You look awesome and I love the outfit! Just started following you on Pinterest. Those are some of my favorite places to shop! I love this, Patty!!! You are beautiful outside, too! I think you should do more fashion posts... I've always been a bit intimidated to do one myself, but you rocked it!